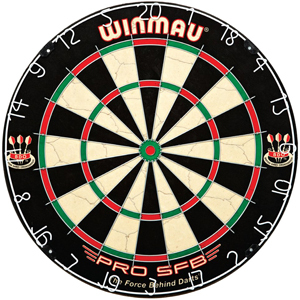 Winmau is one of the leading manufacturers for steel dartboards. 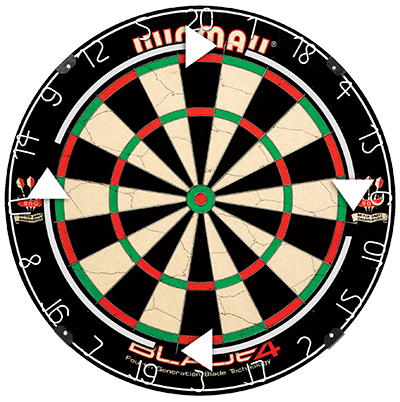 A Winmau Dartboard is always a steel dart board made of sisal material. The British company Winmau has been convinced for many years by consistent quality and new innovations in dartboard for Steel Dart. How long does a Winmau Dartboard hear? This frequently asked question about the general durability of the dartboard is difficult to answer and is always dependent on the environment and how often you use the dartboard. Another factor is of course your throw on the dartboard with regard to the intensity and weight of your darts and the nature of the Steel Dart on the dart. 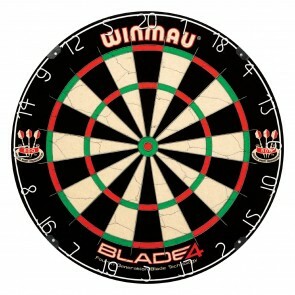 In order to maximize the longevity of your Winmau Dartboard, please refer to the following usage and care instructions. Remove at regular intervals the numeric ring of your Winmau Dartboard, turn the complete writing clockwise by a few segments. This will ensure even wear of the segments. Winmau dartboards are tested in extreme environments, according to the manufacturer, to ensure the highest possible dart board resistance. However, it is recommended to use the Winmau Dart boards in cool and above all dry areas. Above all, avoid direct exposure to moisture, such as rain or extremely high humidity. A Winmau dartboard is made from high quality Kenyan sisal. This premium sisal is then further processed by Winmau's carefully selected staff into the compact and resilient Winmau dartboard. Only in this way can it be ensured that the dartboards are delivered by Winmau in the best possible condition. During darts on the dartboard, the darts have a natural influence on the material and texture of the surface.